MANGO KERNEL OIL – extracted from mango kernels. Mango Butter is rich in antioxidants, and can therefore soften, smooth and moisturize rough dry skin, also due to its emollient properties. It is reported to be useful for treating burns, stretch marks, scar reduction, wound healing and skin regeneration such as the smoothing of wrinkles, and the treatment of sunburns. Mango Oil is very high in natural vitamin C, which encourages the production of collagen, which helps give skin its shape and strength. Good collagen gives a firmer appearance to the skin, and reduces sagging skin. Mango Oil can be used for both external skin applications, and internally, by pouring it over your food. It is sometimes use in the chocolate industry to supplement cocoa butter, due to its similar fatty acid profile and texture. 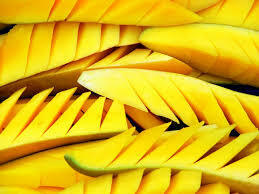 Many have reported Mango Oil beneficial in controlling dandruff, and stopping hair loss, when massaged into the scalp. antioxidant / antibacterial / antiviral / anti-inflammatory / anti-allergy. Moisturizing essential fatty acids, such as oleic acid, and stearic acid, help add moisture to the skin’s layers, repair damaged cells, and improve elasticity. Mango Oil is also the ultimate lip balm. Mango Oil, hardens a little, in cold weather, like Coconut Oil, but easily melts once it touches the body, so you can use it as a body moisturizer all year round. Gently warm the bottle, so that it becomes an oil. In the cooler months, it has the texture of a soft Mango Body Butter, and during the warmer months, it becomes Mango Oil, almost colorless, and readily absorbed. Mango Kernel Oil is a natural source of vitamin A, which encourages healthy cell turnover. This keeps skin firm, and reduces fine lines and wrinkles. The above nutrients go to work treating treating dry skin, flakiness, eczema and dermatitis, and even psoriasis. Its special anti-inflammatory and anti-allergy properties can calm insect bites and poison ivy rashes, reducing the itching and stinging.